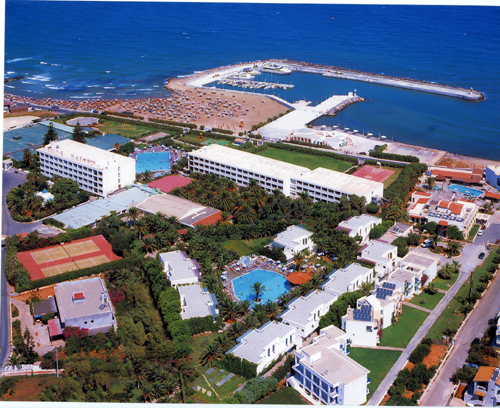 Marina Hotel is an 4 Stars hotel ,situated , only 15 Kms from International Airport of Heraklion “Nikos Kazantzakis”, surrounded by large well kept gardens , on the long sandy beach of Gouves . Marina Hotel is an ideal Beach Resort Hotel ,with 310 rooms in the main building and 90 bungalows, the hotel has a total of 400 rooms. All rooms are comfortable, spacious and tastefully furnished equipped with private Bathroom ,fully computerized telephone system , safety deposit box central air conditioning in the main building ( Units in Bungalows ) refrigerator, hair drier, satellite TV , with balcony or terrace. The bungalows are very comfortable and from an architectural point of view are designed to look like a typical Cretan village and are ideal for family accommodation..
Irrespective of the season you choose to come, your age or purpose of your visit to Crete the hotel Marina makes the following pledge to you: "Gastronomic delight, entertainment, quality service and accommodation."